Last Thursday saw a guest post from a student who had applied to the University of Western Ontario's Brescia College for a nutrition program who along with her acceptance letter, received candy to mark her "sweet offer" of admission. Well this story has a happy ending as the food and nutrition faculty at Brescia, when they heard about these "sweet" offers, immediately set out to rectify them. The fact is, a small handful of M&Ms in and of itself isn't the problem but rather the problem is the societal normalization of candy and junk food at every turn. Brescia’s Food & Nutritional Sciences faculty have heard the message from the guest blogger on Dr. Freedhoff’s website, and we strongly agree that sugary treats are a common and unnecessary reward that needs to addressed in all policies. 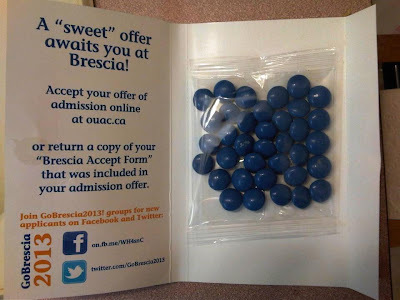 Providing a “sweet offer” to prospective students is a new practice Brescia’s Registrar’s office implemented during the Valentine’s and Easter mail out and while it meant no harm, it was unfortunately a decision that was not communicated in advance to the staff and faculty in Nutrition & Dietetics. At Brescia, we teach our students to think boldly, lead passionately, and make positive changes in our communities by taking action and leading by example. In particular, our nutrition faculty teach our students to consider the food environment and its impact on individual food behaviours. Drs. Dworatzek and Matthews, together with food services, have even implemented a peer nutrition education program called FRESH which aims to change the food environment on campus. The comments made by this prospective student mirror the values we try to instill in our learners, and it would be an honour for Brescia to accept such a bold young leader who is working hard to make a difference. Her comments have not fallen on deaf ears; Brescia’s Division of Food & Nutritional Sciences immediately addressed this issue internally and have committed to work closely with the rest of the College to ensure that both our environment and our communications are health-promoting. Thank you for bringing this to our attention so that we can take the lead, in practicing what we teach!